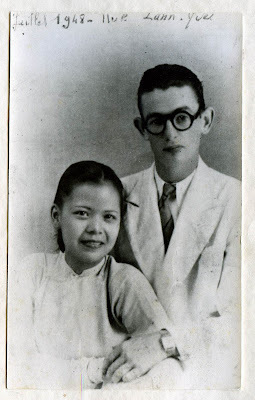 So my grandfather Yves Candeau married Phuong Lan and they lived happily every after. To fulfill all three marriage conditions, they remained in Vietnam, she never danced and she never cut her long jet black hair...until...wait, I'm getting way ahead of myself here! That's not how it happened. "By the time the Ha Long Bay Agreement was signed, the DRV controlled a large part of northern Vietnam, most of the narrow strip of land along the central coast, and the rural areas, marshlands, and jungles of southern Vietnam. The French controlled only the large cities." From October 1949 the DRV was invigorated by China's support. War with the French army continued for several years and culminated into the battle of Dien Bien Phu in March 1954 where the French suffered a humiliating defeat. 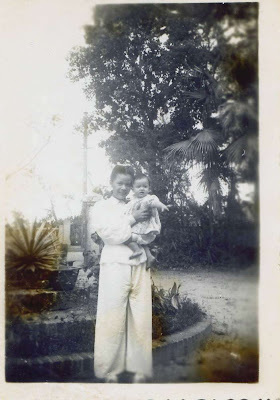 During this entire period which spanned over 6 years, my grandparents honoured Tran Tien Thuoc's wish that they remain in Indochina. 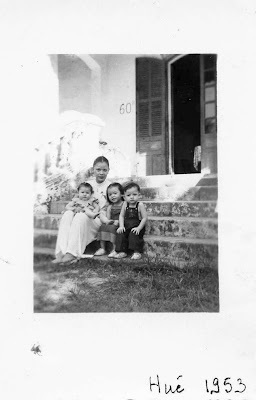 They had 4 children of whom my mother was the eldest. If Yves Candeau had an online blog in the English language between 1948 and May 1955, it would have gone something like this. I've been in Hue since December 1947 now. New job. Normally accommodation is assigned by the government but I did not apply so I have been living in the Hotel Saur. So first post, no one stops us. One of the guys happens to be a pilot and he somehow manages to persuade the sentinel to lift the gate. We drive through without a hitch. But at the second post, things get a little complicated...the sentinel refuses to obtemperate and to lift the gate for us. Nothing works. Next thing you know, he calls in his chief while we wait in the jeep. Chief comes out, doesn't look too happy. He orders his boys to shoot at us!! They're shooting at us!!! The chauffeur spins the jeep around as bullets fly past and narrowly miss us. Luckily the chauffeur had anticipated this and he quickly manoeuvres the car back on the road to where we came from. It is very late when the officers drop me as quietly as possible in front of Hotel Saur. Upon inspection, we discover that the bullets have made a few noticeable dints in the jeep's chassis...but we hope that no one will notice??? The jeep is returned and the officers go to bed. So that was my little adventure last week. The next day was panic. The gendarmerie went into a total frenzy!!! Apparently, someone had rung up to notify the authorities and explained that during the night, a jeep whose passengers included one civilian (me) and three military officers had attempted to force one of the gates....aaaaagh!!!! The jeep and the officers were soon identified and my drinking friends were taken in for questioning. They were good guys and refused to reveal the identify of their civilian accomplice. So the gendarmerie led an enquiry to discover who it was. After several fruitless days, they gave up and filed the case. I forgot to mention this. I met a Vietnammese girl at work. Miss Phuong Lan. She has a sharp wit and an eye for detail. With my usual gauche manner (and yes, I'm left handed), I've since become a target for her jokes. She's often jesting and laughing about me in Vietnamese with her other colleagues. I am making a real fool of myself here. Today I asked her out but she said no. Must be my ears. My life in Hue is so wonderful. Phuong Lan and I have been dating for a couple of months now. We'd usually see each other after work and then split up just before she arrived to her family's house. Today she presented me to her parents. Well, sort of. She told her dad, Mr Tran Thuoc that I was her French tutor...She emphasised that the mastery of the French language was part of a work requirement! I do not know that Mr Tran was convinced considering that his daughter's French is already impeccable and that they all speak it fluently. So nervous. I'm so happy! Today, I couldn't hide my enthusiasm and I asked Phuong Lan to marry me. She said yes!!!! Everything is going so fast. We've talked to Mr Royannez and explained our situation. I know that her family in particular doesn't condone marriage between the Vietnamese and the French. But we are hoping that Mr Royannez will know how just the right words to say to her dad and how to make a favourable impression on my behalf. The two have been friends for years now so I have a good chance. Well for those of you who don't know Phuong Lan and I got married last month. We had a great get together with friends and some members of her family. Some of the officers came too. The day went well. Phuong Lan was a little upset because some of the people that she invited didn't bother turning up. But we still had a wonderful day. Here is a recent photo of us together. 1949 already. Been married for almost a year now. Phuong Lan is heavily pregnant and due in August. Not long after our wedding, we left Hotel Saur and took up residence in our assigned accommodation, a little house near the Phu-Cam canal. This is the extreme limit of the protected sector in Hue. Our place is just across the SIPEA power plant. It's also in close proximity to the points that Viet Minh soldiers use to infiltrate the town. So it's not without its dangers... Sometimes we find ourselves at the heart of loud, fiery exchanges. At night, the sound of blasting artillery intensifies. I don't hear a thing when I sleep but Phuong Lan tends to wake up easily. She stirs through the night and once she is awake, she tries to wake me up as well. I usually tell her "It's nothing, just sleep..." as my hand grabs one of the grenades from underneath our bed...just in case. Here are some photos of our little bundle of joy, Annick. She was delivered last year by the Doctor-Commandant Pinson and the Doctor-Captain Cleret at Hue Hospital. That's her on the right with her Thi-Ba (nurse). Here is a photo of me in my áo gấm!!! What do you think? Do I look the part? 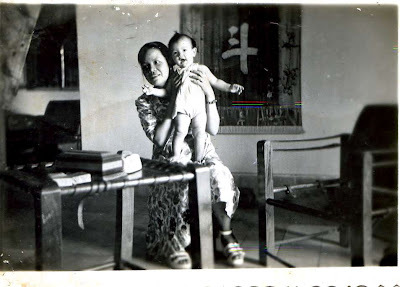 Since August 1952, I have been offered a new job in Tourane (Da Nang) as Chief of Administrative Services & Accounting. My new employer, Mr Beurnez, is none other than the man whom Phuong Lan's mother married!! Life is certainly strange. Initially, I was commuting to work without the family but since October, we are now all settled in Tourane. The only problem is that we are still waiting for our accommodation to be finalised and have been living in Hotel Morin for a couple of months. Last time I wrote, we were waiting for our accommodation to be finalised. The situation was becoming ridiculous. It had been 6 months and we were still living in Hotel Morin! But I have good news. I received a letter from M. Chassigneux (the chief accountant at the SIPEA power plant). He explained that he needed to urgently return to France and offered me a position as Chief Accountant at l'Institut d'Emission des Etats Associes D'Indochine* based in Pnom-Penh. Of course I agreed immediately. This also solves our accommodation problem. It turns out that my current employer is in a financial mess mess anyway and his company is undergoing liquidation. Mr Beurnez was only too happy to let me go. *In 1953, the Institut d'Emission des Etats du Cambodge, du Laos et du Vietnam took over the issuance of paper money. Hello from Cambodia. My work probationary period is now over. So all is well. The Candeau family is fast growing here in Indochina. I am missing France a lot but happy to be with my family. I realise I haven't posted photos for a while. We now have a son called Claude and another daughter called Helene. Here is Phuong Lan beaming with her little cubs. The last week or so has been a blur. I've been so out of it for a while. It started one morning. I went to work as usual but began to feel dizzy. Everything was spinning and my legs felt too heavy to move. I couldn't concentrate and decided to go home. It was Phuong Lan who found me. Apparently I was in a comatose state and she was very worried. She called the doctor immediately. It turns out that I had Dengue fever!! Even with the drugs that the doctor prescribed and which were quite effective, it took me 8 days to finally regain consciousness!! I remember that day actually. I woke late in the morning, confused and wondering what I was doing in bed. I was starving and decided to have lunch. So I get up, my legs still a little shaky under me and regain my seat around the dining room table. Everyone's there. Next thing you know, I'm passing out again. I collapse from my chair and onto the floor. So that was me in the last two weeks. My adventure in the dining room table was apprently due to weakness. Since then, I have been eating very well and resting so I'm feeling better. General Navarre is currently carrying out an attack in Dien Bien Phu. At the same time my organisation has been transferred to Saigon since the beginning of 1954. It's chaos back here and a lot of people are moving down to the South of the country. Since May 1954, the Institut d'Emission des Etats Associes d'Indochine has been dissolved. I will soon be out of a job. 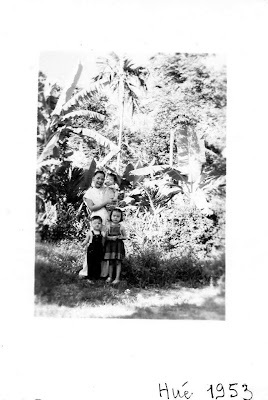 I'd really like to return to France but I promised that we would both live here, in Indochina. Not sure what to do. I'm thinking of applying to each of the Banque Nationale branches in Laos, Cambodia and South Vietnam to see if there is an accounting position available. I have received three negative replies from the Banque Nationale. Well number four came in on February 1955! Her name is Genevieve. The other good news is that we are finally returning to France! Yes, you read correctly!!! As you know I was having problems finding a job here, in Saigon. 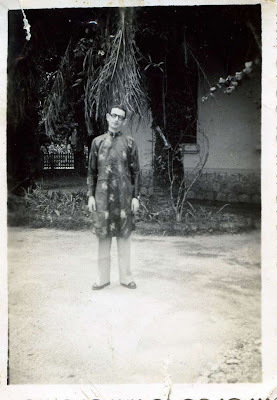 But my father-in-law came from Hue to visit us the other day. We talked and he has officially freed me from my obligation to remain in Indochina. I'm a free man! I just have a few financial things to sort out before I leave. My previous employer still hasn't honored the value of my accummulated leave....this, and a few things total up to 19.000.000 FF*. Luckily Phuong Lan's first cousin, Mr Tran Tien-Tranh, is going to help with processing the claim. Phuong Lan isn't very happy about going to France. But it's just becoming impossible for me to find work here. And it's not safe. *In 1960 the French Franc was revalued to 100 existing Francs. At this time, the owed sum would have evaluated to 190.000 French Francs or approximately $40,000 US. I'm ok though. When I left the Institut d'Emission, I received a letter of recommendation. I'm thinking it will come in very handy.